This book is the seventh written and published by Ken Marshall. At eight-six he pretty much sums up the entire life of the author, warts and all. It began as an argument against the theory that World War II ended the Great Depression. 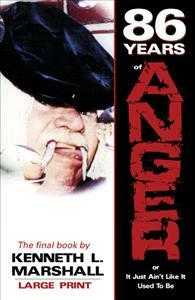 It ended up being a process whereby he vented all of his anger pent up over a lifetime. He has poured out all his anger at the world starting with the Great Depression and ending at eighty-six with his promise to God to do whatever He asked following his total loss of hearing.